A wide range of groups came together to make this happen, including: Brighton BDS, Brighton Palestine Action, Smash EDO, Stop NATO Cymru, Anarchist Action Network, East Kent CAAT, Swansea Action for Palestine (with a bit of support from us too). During last Summer’s ‘Operation Protective Edge’ attack last Summer, armed drones killed 830 Palestinians in Gaza. 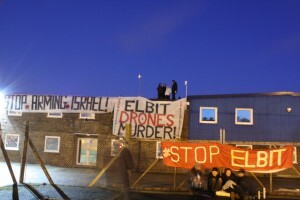 85% of the drones used by the Israeli military are supplied by Elbit. Elbit’s share price rose in July off the back of the extensive use of its technology during Israel’s massacre,and the company recently reported a backlog in orders worth $6.2 billion. Elbit advertises its products as ‘combat proven’, by which they mean their products are tested on the bodies of Palestinian civilians. 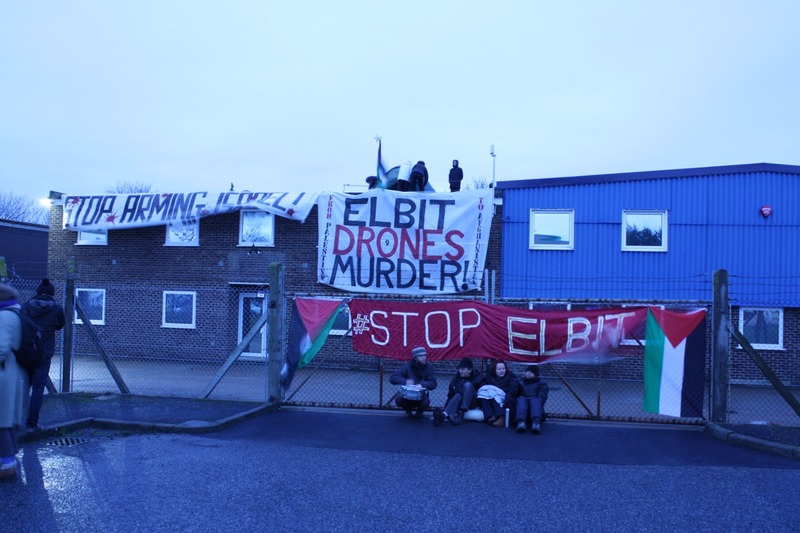 This is the second UK-based Elbit factory to be targeted by activists, after the successful occupation last summer of a drone engine factory near Birmingham. 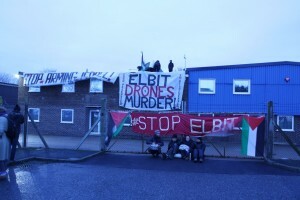 Elbit’s electronics are used in Israel’s apartheid wall, which stretches for hundreds of miles across the West Bank separating people from their loved ones, farmers from their fields and is intended to colonise more land for Israel and its settlements. Palestinians have called on governments to impose an arms embargo on Israel, and not to buy arms from Israeli companies like Elbit. Abdulrahman Abunahel from the Palestinian Boycott, Divestment and Sanctions (BDS) movement said: “We call on governments around the world to do the very least they can to stop Israel from carrying out more massacres of our people by imposing a military embargo on Israel. Such steps would be in line with growing public support for our struggle and for the boycott, divestment and sanctions (BDS) campaign”.